This refreshing fried mint - pudina chutney can be served with dosa, uttapam, chapati, plain rice. As it can be served with so many dishes, it is definitely worth making. You may use fresh coconut or dried coconut as you wish. If you use dried coconut, you can keep it longer. - Tamarind(optional)- a small ball. - Garlic(optional) - 2 cloves. - Wash the mint leaves nicely and soak the tamarind in some water(optional). - Heat the oil in a pan and fry channa dal and urad dal till brown. - Add the Mint leaves and red chillies to the pan and fry for 1 minute, in a low flame. - Add hing, garlic, tamarind and coconut, fry it for just 10 seconds. - switch Off the stove and keep it for 5 minutes(to cool down). - Grind the fried ingredients with adequate salt and water to a paste(don't go for a nice paste). - Heat oil(1 teaspoon), add mustard seeds(2 pinch) and curry leaves(4-5). - When they stop spluttering, add to Chutney and mix well. 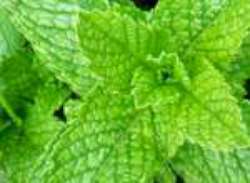 - The same recipe is used for coriander leaves instead of mint. - You can also grind it without adding much water(just 3-4 tbsp of water)to a thick paste for Rice(Plain rice with ghee/Curd rice). This chutney is very tasty as it is fried and not 'raw-grind-ed' and thus the taste get enhanced. Also mint is good for digestion. Well this is a dish that will be loved by you all. It is a good add on to any of your items and can be mostly used for a great cause too. The spices can be altered accordingly to one’s taste too. Do try it.